We Are Social and Hootsuite’s latest collection of Global Digital reports reveals that internet users are growing by an average of more than one million new users every day, with all of the original ‘Next Billion Users’ now online. Now, just before we get started with all those numbers, you may want to go grab a coffee and get comfortable. There’s a huge amount of information to digest in the 8,800 words below — I’ll cover global internet penetration, amount of users and internet speeds, global social media usage, numbers for each major social media platform, status of ecommerce, etc. — so you’ll want to take your time to make sense of it all. With thousands of charts across more than 200 global and local reports, this year’s Global Digital series is one of the most comprehensive and up-to-date studies of today’s connected world. We’ll be publishing the local country reports in stages over the coming days over on DataReportal – our dedicated reports library – but this article and the SlideShare embed above distil the essential headlines, trends, and insights you need in order to make sense of digital in 2019. OK… all set for those numbers? Our latest internet data – collected and synthesized from a wide variety of reputable sources – shows that internet users are growing at a rate of more than 11 new users per second, which results in that impressive total of one million new users each day. It’s worth noting that some of this growth may be attributable to more up-to-date reporting of user numbers, but that doesn’t detract from the implications of this growth. The number of internet users around the world has grown by more than 1.9 billion since our 2014 reports, an increase of more than 75 percent in just five years. This year’s total of 4.39 billion global users is also more than double the figure of 2.08 billion that we reported in our first Global Digital report back in January 2012. The ways in which people use the internet are evolving quickly too, with mobile accounting for an ever-increasing share of our online activities. I’ll dig into the specifics of mobile and app use in the dedicated mobile section below, but it’s worth noting here that mobile phones now account for almost half the time that people spend on the internet. Ecommerce sites have been steadily rising through the ranks of these lists over the course of the past year, and Alexa’s latest data puts five ecommerce sites in the top 20 ranking. Chinese platforms are particularly well represented this year, and it’s worth highlighting that both Taobao and Tmall now rank higher than Amazon in terms of global traffic. People are spending an increasing amount of time watching other people play games online, too. The latest numbers indicate that almost a quarter of all internet users – more than 1 billion people – watch livestreams of other people playing games each month. Meanwhile, more than 700 million people will watch esports in 2019 – that’s double the number of people who watched Formula 1 in 2017. At the other end of the scale, North Korea continues to languish in last place in the global social media rankings, with a penetration figure of less than 0.1 percent. This is perhaps unsurprising though, considering that the internet – or at least the internet as the rest of the world knows it – remains blocked throughout the country. We also suspect that the figures for Turkmenistan may actually be higher than those reported here, but we have been unable to source data from the county’s top platform, imo. However, comparisons to total population are less representative when it comes to social media, because most platforms prohibit use by children. As a result, this year’s reports also include analysis of what we’re terming ‘eligible penetration’ – i.e. social media use among adults aged 13 and above. While these figures are specific to social media users, they’re likely representative of broader internet use too, which suggests that women suffer from poor levels of internet access in many parts of the developing world. As an essential resource for education, financial inclusion, employment, and empowerment, ensuring more equal internet access for women must be a priority for the next phase of internet development. YouTube comes in at number two in this year’s rankings, but the world’s favorite video site posted some impressive new user numbers over the past year, and looks set to be the next social platform to break the 2 billion user mark. The key takeaway here is hiding in plain sight: people engage with the things that they’re most interested in. That might sound like a glib statement of the obvious, but marketers must recognize that no amount of Facebook media investment will make their content more interesting, or more engaging. Instagram’s growing popularity among marketers isn’t just down to a growing user base, either; the platform also boasts a well-balanced audience profile. Globally, Instagram users are split roughly 50:50 between women and men, and – while the average age still skews younger than Facebook – Instagram has a higher incidence of users in the 18 to 34 year-old age bracket than Facebook does (albeit with a smaller total number of users in that age range). Instagram is also popular in a number of countries where Facebook has struggled to gain traction against local favorites. In particular, Instagram has gained a sizeable – and growing – audience in Russia, and this trend is mirrored in a number of Eastern European and Central Asian countries. 2018 was less favorable to Twitter, who reported declines in global active users in their two past earnings announcements. This downward trend is clearly visible in the platform’s advertising audience numbers too, which indicate that Twitter’s total addressable audience has fallen by 1.5 percent since October. Twitter’s advertising audience also skews significantly towards men, with the platform reporting that almost two-thirds of its addressable audience is male. My assessment of these numbers is that what previously made Snapchat appealing may also be contributing to its present declines. The platform has consistently appeared to focus on younger users – particularly those in the 13 to 24 year-old age bracket. However, people in these age groups tend to be more fickle in their social media behaviors, and while this targeted approach may have served Snapchat well in previous years, the platform seems to be struggling to maintain its appeal amongst its core audiences. Crucially, Instagram now boasts almost twice as many users as Snapchat in the same age bracket – and Instagram’s numbers are still growing. Furthermore, unlike Twitter, there’s little evidence in other data to hint at a remedy for Snapchat’s ails. The focused functionality of Snapchat’s platform was part of its initial success, but that focus leaves the company with fewer options now that the strategy seems to be delivering less favorable returns. Fortunately, we return to good news in our analysis of LinkedIn. The world’s favorite professional social network delivered strong results over the past year, with the platform’s total addressable advertising audience growing by more than 3 percent in the last quarter of 2018 alone. The world’s favorite video platform doesn’t share in-depth insights into its advertising audiences, but this year’s reports include some other YouTube data points that marketers will find useful. Unfortunately, WeChat, LINE, and VKontakte all declined our requests for more detailed insights into their worldwide audiences, so we’re unable to provide any richer insights for these platforms beyond headline user numbers. As always though, I’m hopeful that this situation may change, so if anyone from those companies is reading this and would like to share data for future reports, please get in touch. The number of mobile connections around the world has grown by more than 4 percent in the past twelve months, reaching more than 8.8 billion at the start of 2019 (note that this figure also includes IoT cellular connections). However, the typical mobile user around the world now has an average of 1.73 mobile connections, so we must be careful not to misinterpret connections as unique users. Three-quarters of the world’s mobile users pay for their connections via top-ups rather than paying by monthly installments, down slightly from the 76 percent we reported this time last year. However, the picture varies from one extreme to the other across the globe. With roughly 5.5 billion smartphones in use across the world today, it’s little surprise that the mobile app market is booming. The latest data from App Annie show that app downloads increased by nine percent over the past 12 months, reaching close to 200 billion total downloads for full-year 2018. What’s more, people are spending considerably more on apps too. App Annie reports that the world’s smartphone users spent more than $100 billion USD on apps in 2018 alone. Comparing this against the number of smartphones in use around the world that Ericsson reports for 2018, this would mean that the average smartphone user now spends more than $20 USD on apps each year, and this figure is even higher in more developed economies. Perhaps unsurprisingly, this surge in app usage has also contributed to a significant increase in the amount of mobile data we consume. Ericsson’s latest Mobility Report shows that the world now consumes more than 20 billion gigabytes of mobile data each month, while data in the company’s Mobility Visualizer tool indicates that the average smartphone device now consumes almost 7GB of mobile data every month. It’s important to note that Statista has revised all of its ecommerce data since our Digital 2018 reports, so – once again – these numbers will not be directly comparable to the figures in last year’s reports. However, the good news is that Statista has also shared updated data on annual growth, so we can still report detailed insights into annual growth. At 17 percent, ‘Fashion & Beauty’ posted the strongest growth over the past year, with annual global spend in the category now topping half a trillion US dollars. However, online travel and accommodation bookings accounted for the largest share of consumer ecommerce spending in 2018, with users around the world spending a combined $750 billion USD on online travel over the course of the full year. The number of ecommerce users has also grown considerably since last year, with Statista reporting that more than 2.8 billion people around the world now shop online. These shoppers are spending more money too, with the latest global average revenue per user figures (ARPU) up by more than 10 percent year-on-year to reach $634 USD. Ecommerce penetration is still quite varied around the world though, and there is still plenty of room for growth in some of the world’s biggest economies. GlobalWebIndex reports that 74 percent of Indian internet users say they have purchased something online in the past month, but with internet penetration in the country hovering just above 40 percent, there are still hundreds of millions of people across the country who have yet to join the ecommerce revolution. Digging a bit deeper into the ecommerce data, we’ve compared the latest ARPU figures to GDP per capita, making it easier to get a sense of how important ecommerce is across different countries. The standout story in this comparison is China, where people spend more than 7 percent of GDP per capita online. Meanwhile, data from Worldpay’s recent Global Payments Report allow us to look at ecommerce spend in the context of broader retail spend. We’ve combined the figures Worldpay have reported for both ecommerce and offline point-of-sale spends to create a proxy for ‘total retail spend’, which we can use to understand ecommerce’s overall share. As you might expect, the figures vary considerably from one country to another, but those individual numbers make for insightful reading. It’s particularly interesting to note that – despite the strength of ecommerce in China – the country isn’t even in the top 10 in this list. Voice control will increase in importance: the next phase of internet growth will come almost entirely from developing markets. However, as you can see in the chart below, many of these countries suffer from lower levels of literacy compared to the countries that dominate the internet today. As a result, global platforms like Google, Facebook, and Amazon will look for more user-friendly interfaces to serve these new users, and voice looks set to dominate these efforts, at least in the near term. For clarity though, this isn’t a story about the rise of smart speakers in Africa; rather, it’s about a complete and revolutionary change in the way people interact with connected content and devices. The social landscape will evolve: with some of the world’s top social platforms losing users over extended periods, it’s likely that we’ll see some attrition and consolidation in the social media industry over the coming months. If current downward trends continue, we can expect investors in both Twitter and Snapchat to increase pressure on those companies’ boards to accept an offer of acquisition. At the same time, it feels like ‘the next big innovation’ is already overdue. However, this isn’t about the move to the ‘stories’ format, much as that will inevitably be one of the biggest stories in social media in 2019. Rather, my sense is that privacy concerns, changes in people’s social media preferences and behaviors, and broader fatigue with existing platforms will all combine to inspire a series of new social platforms in 2019, perhaps making use of new innovations like Tim Berners-Lee’s SOLID. This would fundamentally change the very fabric of business on the internet though, so expect to see plenty of resistance from the ‘Four Horsemen’. Marketing as a service: looking behind the scenes of the brands that achieve the greatest success on the internet, it becomes apparent that many of them share something in common: they treat marketing as a service. Rather than pumping out endless corporate propaganda and trite advertising, these brands use their marketing budgets to create things of value for their audiences. Whether it’s something as simple as a valuable how-to video on YouTube, or a large scale event that puts the audience at the heart of the action, this ‘marketing as a service’ is the only antidote to ongoing media inflation and the audience shift from newsfeeds to stories. 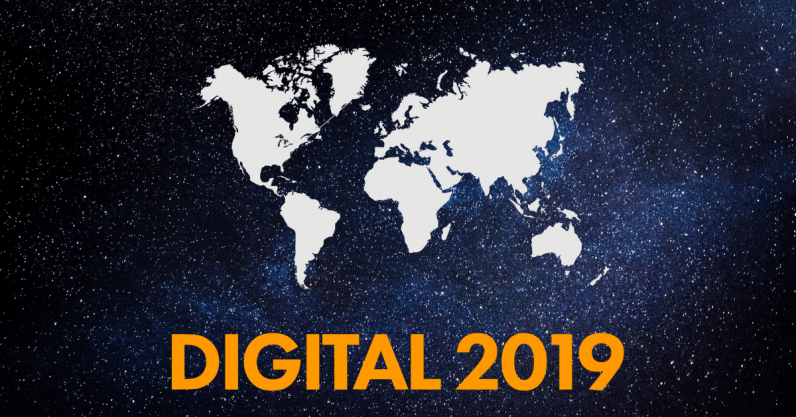 If you’d like to dig deeper into the full collection of Digital 2019 reports, you’ll find every one of them for free over on DataReportal.com, together with all of our previous reports from the past 8 years.